City University London has made three new appointments to its Council: Brendan Barber, Iain Gray and Andy Friend. Commenting on the appointments, Pro-Chancellor and Chair of Council Rob Woodward said: "I am delighted to welcome Brendan, Iain and Andy to City's Council. Together they bring a huge wealth of experience in a variety of public and private sector organisations. They further strengthen the composition of Council and we will benefit greatly from their contributions in the years ahead." Professor Paul Curran, Vice-Chancellor, added: "Brendan, Iain and Andy join us at an important time for the University as we continue to implement our Strategic Plan 2012 to 2016. Their experience and insight will be invaluable in helping us achieve our ambition to be a leading global university positioned within the top 2% of universities in the world." 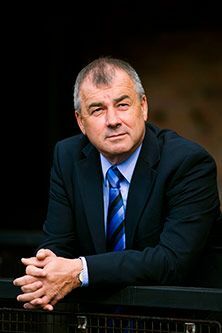 City University London alumnus and former President of the Students' Union, Brendan Barber graduated with a BSc in Social Sciences in 1974. Speaking about his position on Council, Brendan said: "As an alumnus of City I have first-hand knowledge of the University and I am delighted to be continuing my association. City has a proud heritage dating back to 1894 and Andy, Iain and I are keen to help the University secure a confident future." In 1975 Brendan began a 37 year relationship with the Trades Union Congress (TUC). Initially working as a policy officer, he held several roles before being appointed Deputy General Secretary in 1993. In June 2003 he became General Secretary, a role he held until his retirement in 2012. Brendan was awarded an Honorary Degree from City University London in 2007. Iain Gray is the Chief Executive of the Technology Strategy Board (TSB), a role he has held since the Board's establishment in 2007. Building on his past experience as a leader of technology-driven manufacturing businesses (including Airbus UK), he has shaped the TSB into a body with an annual budget of some £400 million. It has a mandate for innovation that embraces manufacturing, digital, energy, health, transport, construction and food sectors. Andy Friend's near 40 year career has spanned the voluntary, public and private sectors in the UK and Australia where he has managed complex capital projects in multi-stakeholder environments. During his time in Australia he was appointed Chief Executive of the city of Melbourne. Between 1999 and 2006 he held positions as Managing Director of Laing Investments and as Group Chief Executive of John Laing plc. Andy has advised Departments of State and supported the Cabinet Office in its capability review programme. He sits on both financial services and infrastructure construction companies' boards and recently completed a six year term as a Trustee of Oxfam. Brendan and Andy joined Council on 1st January 2013 and Iain will join in April. All appointments are for a three-year term.